Papa DENIS WILMOTT HANSEN: an Indian Association, WIA, granted first ever life membership, not to an Indian, but to a Maori elder, a chief, Kaumatua Hansen. 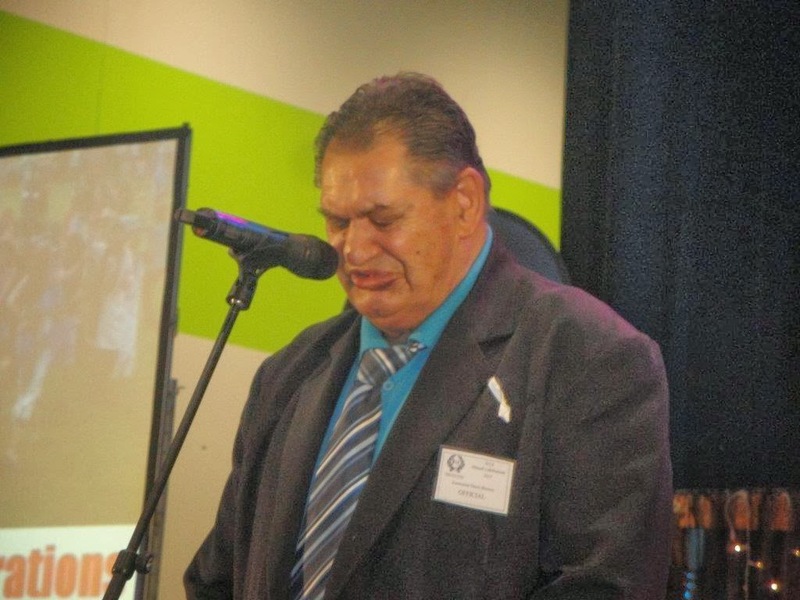 In an unprecedented historical gesture and as an epitome of how a migrant community adopts Aotearoa as its home, Waitakere Indian Association (WIA) has posthumously granted first ever Life Membership to a Maori Elder, KAUMATUA DENIS WILMOTT HANSEN. It was intended to be handed over to Kaumatua Hansen in person during Waitakere Diwali on 12 October, 2013. But, but alas, Kaumatua had his call before that and left us for heavenly abode on 4th September, 2013. Diwali Mela missed its Kaumatua who had been a pillar of support for many Diwalis. 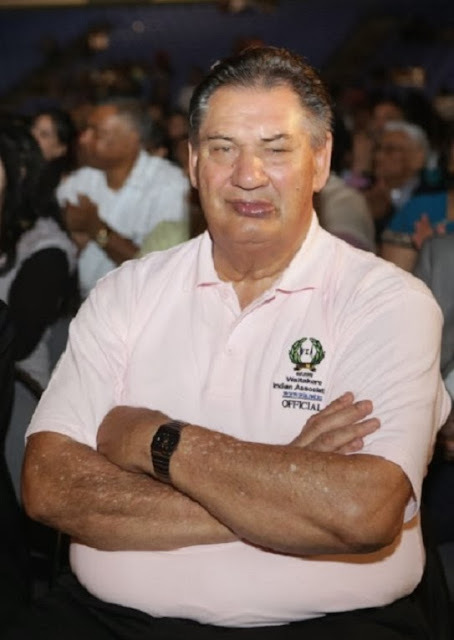 Indeed, Kaumatua HANSEN was remembered through his cousin from Northland, Ricky Hansen who had especially travelled to bless the occasion and shower Maori blessings to Diwali that Denis Hansen would otherwise have given. Maori blessings have been a hallmark of any event that this Indian organisation held. Ricky Hansen, who bore close resemblance to his departed cousin, addressed the formal ceremony of Diwali, and spoke about empty seats - and one was that which Denis Hansen used to occupy, and would have occupied if he was there. RICKY HANSEN - cousin of Kaumatua Denis Hansen, came from Northland to bless Waitakere Diwali and honour his departed cousin, Denis. In a historical move, an absent Kaumatua was deservedly honoured. The Life Membership plaque was presented by a close family friend of Kaumatua, Social Development Minister Paula Bennet. On hand to receive the gesture were Kaumatua’s daughter Roimata Hansen and Hansen’s son and namesake Denis (Denny) Hansen Junior. Minister Paula Bennett, presenting Life Membership plaque to children of Denis Hansen, Roimata Hansen and Denis Hansen Junior. 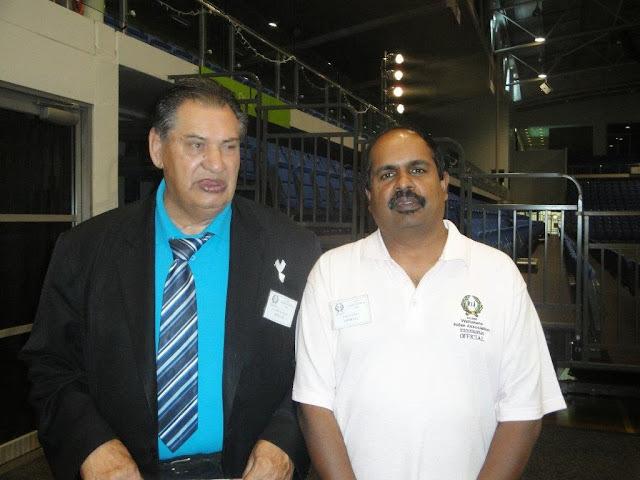 On extreme left is Naveen Prakash, President of Waitakere Indian Association. Minister Paula Bennet spoke fondly and highly of a departed Chief. “He (Kaumatua) was a great man and what he did for Indian community was something particularly close to his heart, “said Paula Bennet, while presenting the Life Membership plaque to Roimata and Denny Hansen Junior. Denny Junior thanked the Indian community for this gesture.” Kiaora koutou our Indian whanau, thank you for honouring my Dad by making him an honorary Indian. My Dad loved you all so much and shared wonderful wisdom with you, because of his love for the indigenous people of the world. Kia kaha, kia u, kia manawanui. Hei konei ra,” Denis Junior said. Minister Paula Bennet, very smartly dressed in Indian costume (left) with children of Kaumatua, Roimata (centre) and Denis Hanson Junior, proudly displaying WIA Life Membership plaque. This gesture was of greater significance for the reason that an Indian Association had granted first ever life membership, not to an Indian, but a Maori elder, who had always been regarded as part of the Indian Community in West Auckland. Kaumatua’s close friend at Waitakere Indian Association, Executive Mahendra Sharma spoke fondly of a great man. With tears in his eyes, Sharma spoke about fond memories of Kaumatua who was regarded as part of his family, and usually popped into his Ranui home for a cup of tea, a bilo of kava, a fatherly chat or a curry meal. “Papa Hansen had been a strong bridge between Maori and the migrant communities. My wife and children were also fond of this respectable elder. He had been a great leader and it was the least our Association could do for him. We all salute him,” said Mahendra Sharma. A great leader was saluted by all, and very appropriately honoured by Indian community who picked the blossomed flower of friendship that Denis Hansen always watered. May his souls rest in peace and his bridging gesture be adopted by his successors.